Algonquin Young Readers, 9781616204198, 272pp. A message has traveled via the mouse network to cat brothers Anton and Cecil: their rodent friend Hieronymus has been captured. Though he’d rather stay close to home, Anton must get to the friend who saved his life. Cecil is quick to action, too, but it’s adventure he craves. Boarding one of the machines the mice call “landships”--noisy, smoke-belching trains--Anton and Cecil travel to the heart of the Wild West. 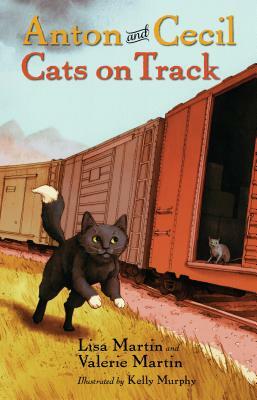 Along the way Cecil is tossed out by the train’s conductor, only to face huge bison, chattering prairie dogs, and the most dangerous creature of all, a boy who wants to make Cecil a pet. Meanwhile, Anton’s search leads him to stampeding herds, menacing rattlesnakes, and fierce, enormous cats. In this perilous territory, do Anton and Cecil have the courage and wit to find and save Hieronymus? The heroes of Anton and Cecil: Cats at Sea, which the New York Times called “engrossing and unpredictable,” return in an exciting adventure that will delight fans of the first book and new readers alike. Lisa Martin has worked as an educator and children's poet and currently resides in Charlottesville, Virginia. This is her first series for young readers. Orange Prize-winner Valerie Martin is the author of nine acclaimed adult novels, including Property and The Confessions of Edward Day. She lives in Millbrook, New York.